Volume 11, Issue 40; October 5, 2011: How Did I Come to Be So Overworked? You're good at your job, but there's just too much of it, and it keeps on coming. Your boss doesn't seem to realize how much work you do. How does this happen? Folsom Dam, on the American River near Sacramento, California. 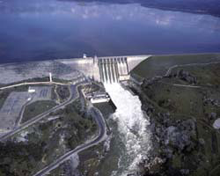 The dam and the Folsom Reservoir are the primary protectors of the city of Sacramento against floods resulting from rainfall and snowfall that cover higher elevations nearby. Being flooded with work is a metaphor more apt than might first appear. Flooding inland, like overwork, can have multiple causes. Whether any particular rainfall or snowfall event or series of events leads to flooding depends on numerous factors, among them: available soil water storage capacity, the ability of the topography to shed water, the ability of the topography to contain flows within established river channels, the region's vulnerability to flows from higher elevations in the watershed, snow melt rates, and the region's ability to store standing water in contained areas. All of these mechanisms have analogs in overload management in the workplace. Photo courtesy U.S. Bureau of Reclamation. Having too much work is a common condition in the modern workplace. Having way, way, way too much work — so much that 70-hour weeks still are not enough to keep from falling behind — is less common, but still too common. Combine way-way-way-too-much-work with ongoing supervisor expectations that the work will get done, and done well, and you have the ingredients for stress, sleep disturbance, declining work quality, toxic conflict, and disruption of home life. It's a toxic stew that can cause permanent harm. We must be honest with ourselves. This degree of overwork is abuse. It threatens our health, and it must end. What follows, this week and the two following, is a sketch of a program for ending this kind of abuse. Let's begin by examining where the work comes from. Work of this kind truly is yours. The question is: "Does the organization need another one of you?" Or maybe, "Should my job be divided?" Affirmative answers to these questions usually occur only when the situation is obvious to all concerned, whether or not anyone acknowledges it openly. Typically, you were already overloaded when your boss gave you yet one more responsibility. And you accepted it because you felt you had little choice. Some supervisors are unaware of the true scale of the excessive workloads of their subordinates. Some are fully aware, but choose to do nothing about it. Some are willfully unaware. Understanding your own supervisor's state of awareness is a first step to devising a strategy for ending the overwork. I picked up this work because "it has to get done"
Sometimes, important responsibilities or tasks remain unassigned or even unrecognized. When they remain open, they sometimes block progress on work that has been assigned. The people who are blocked can then find it difficult to resist the temptation to take on responsibility for this "fallow work." If you've succumbed to this temptation, then you have, in effect, assigned yourself some work voluntarily. Complaining about it later then becomes problematic. willfully unaware.rivals sometimes contend with each other for responsibilities not because they seek those responsibilities, but because they seek to deny their rivals control of those responsibilities. Outcomes in these situations are rarely beneficial to anyone involved, or to the organization. Yet supervisors often let this happen, because they feel they're getting productivity for free. Or they're more comfortable permitting people to overload themselves voluntarily than they are comfortable with overloading people directly. Would you like to see your comments posted here? rbrenkSoAMimUjnnkRppCner@ChacgsEihLIPXuxIfDQPoCanyon.comSend me your comments by email, or by Web form. I offer email and telephone coaching at both corporate and individual rates. Contact Rick for details at rbrenjgzeBTmyYoqyVRuEner@ChacOAlxRIOisUszRSscoCanyon.com or (650) 787-6475, or toll-free in the continental US at (866) 378-5470.